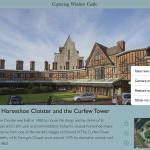 It took a while to realise that when we released Capturing Windsor Castle: Watercolours by Paul and Thomas Sandby from the Royal Collection that this was in fact the third Aimer app with with a Royal connection. This app about Windsor Castle connects a famous set of 18th century watercolours to the present day was produced with the Royal Collection, which as well as being one of the largest and most important art collections in the world, and one of the last great European royal collections to remain intact, is held in trust by The Queen as Sovereign for her successors and the nation. The other two apps with less direct Royal connections? Our Astronomy Photographer of the Year app from the Royal Observatory, Greenwich; and, Decisions on the Rules of Golf 2014-2015, the latest version of our app with the R & A ,which is still for some of us will always be the Royal and Ancient Golf Club of St Andrews.